Chotovelli & Figli is a watch brand that I was not aware of until recently. 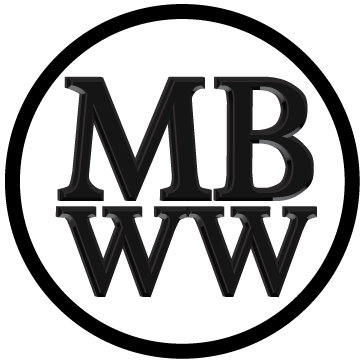 The company was started in the late 1920’s, and is based in Torino, Italy. The business was revived in 2005 by the third generation of the family and concentrates today on producing watches inspired by gauges (or instruments) and speedometers from the automotive and aviation industries. Their emphasis is primarily on design, quality and value. 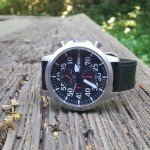 The watch I am reviewing is part of their Aviation line, model JTS3300–11. 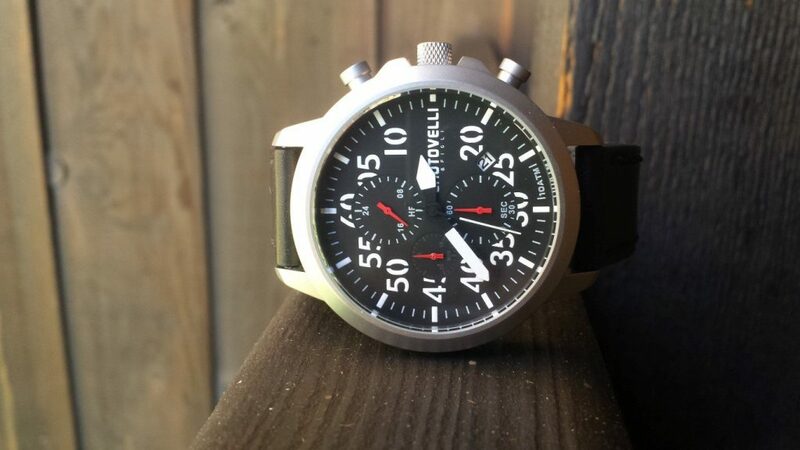 This pilot style chronograph has all white and gray face markings with a gloss black face base and red subdial hands. 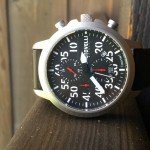 The watch is oversized (45.2mm x 12.1mm) and it stands out from the majority of pilot/aviation watches available today. Most watches in this catagory are too sterile in their design and a bit too small for my taste. The JTS3300-11 beats to a slightly different drummer. I attribute it’s design to the company’s Italian heritage. This 316L stainless watch case has a nice satin silver finish with very attracitve beveling and upper and lower character line encircling the case. 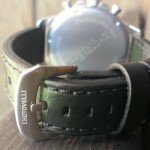 On the 9 o’clock side of the case, the name CHOTOVELLI is nicely engraved, as well as on the outer brushed side of the substantial strap buckle. CHOTOVELLI also appears in white on the watch face running from the center of the dial to the 3 o’clock position. 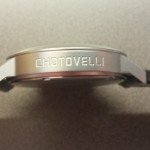 The “& Figli” below CHOTOVELLI on the watch face translates to “& Sons”. The hour, minute and second hands are white with lume of average quality. All three of these hands are black toward the center of the dial, making them appear to disappear. I find this to be a cool military aviation instrument look. All three subdial hands are red and the majority of the watch face printing is in white. Outer face numerals are shown in large 5 second increments from 5 to 60. Most of these numerals are partially covered by the subdials, a style that I find appealing. The small 4:30 date window is black with a white background. The date window also covers a portion of the 20 second and 25 second dial markers. The larger 12 o’clock hours and the 6 o’clock seconds subdials are printed in gray. Please note that the hours subdial does not count hours for timing but instead indicates the hour of the day in a 24 hour format. The small minute subdial at 9 o’clock is printed in very light gray and balances out the face nicely. The flat mineral crystal is slightly raised above the case and both the crystal’s edge and the bezel are beveled. This watch is amazingly comfortable on the wrist. The strap has two substantial loops and is stitched like a good belt. The soft black Italian calf skin strap is the perfect match for this watch, in my opinion. The 3 o’clock stainless steel crown has a very nice knurled and satin finish while the 2 o’clock and 4 o’clock pushers for the chronograph are satin stainless steel as well. 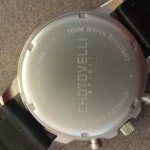 The screw down case back of the watch is also brushed 316L stainless and is tastefully engraved across the center with the company name (and Figli in a tiny font). The words “100M water resistant”, “stainless steel case” and the number assigned to the watch are lightly engraved around the perimeter of the case back. This particular watch is number 51 out of a total production of 999. Powering this chronograph is a Miyota/Citizen Japan JS 15/25 caliber quartz movement with no jewels. In my example, this movement has proven to be accurate to about +5 seconds a month, far better than the +/- 20 seconds per month specified. The second hand is slightly misaligned with the outer second/minute markers, which is common on many quartz watches. This movement is able to time up to 29 minutes and 59 seconds in one second intervals. The battery life is approximately 2 years. For a manufacture suggested price of $260 USD, I don’t expect perfection. The crown is push/pull rather than screw down, but who goes in water with a nice leather strapped watch? 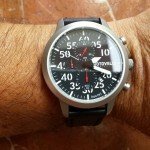 More and a higher grade of lume on the watch face would be welcome as well as an anti reflective sapphire crystal, but these upgrades would raise the watch’s price significantly. Chotovelli has you pretty well covered. 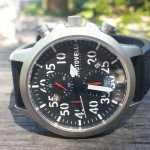 A screw down crown at 9 o&#39;clock with pushers at 8 and 10 o’clock along with an anti reflective sapphire crystal is offered in their JTS 5200-11, 12, 13 and 14 Aviator Pilot chronograph collection for an additional $155 USD to $175 USD. 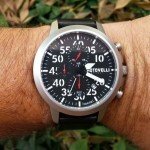 In summary, this is a very attractive, well detailed and well made pilot/aviation themed watch that is a pleasure to wear and a good value. 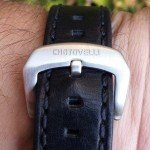 Keep an eye out for Chotovelli and Figli watches! Chotovelli and Figli watches are available from their online store.